Ever noticed how the forest floor isn't piled as high as the trees with dead leaves? That's because every year the leaves rot and bugs and worms and bacteria help turn the old stuff into nutrients to grow new stuff. You can do this too: in the safety and comfort of your own kitchen. How? Compost! First, you need a plastic bin or wooden box. Fill the box with damp — not soaking wet — paper and cardboard shreddings. This is called the worm's "bedding." Add your worms. Be sure they are red worms (red wrigglers). You can order them online or find them at a local bait shop. Don't use earthworms — they won't survive! Chop up your leftovers from dinner — bread, pasta, fruits & veggies and bury them under the bedding. 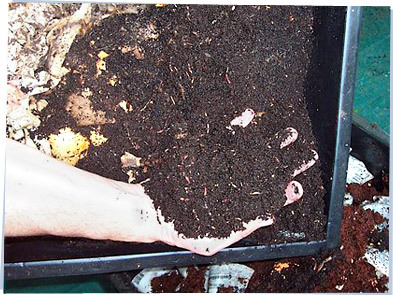 As the worms magically turn your trash into "castings," you can scoop some out to fertilize your garden. Make "waste = food" come true at your own house by starting a kitchen composter. Take a look at how our friends Jamie and Beth did it. For answers to all your worm composting questions, check out this site, from the woman who wrote that ol' classic Worms Eat my Garbage.